I've been working on this half bath off & on for the past couple of months and I'm relieved to say - it's done! 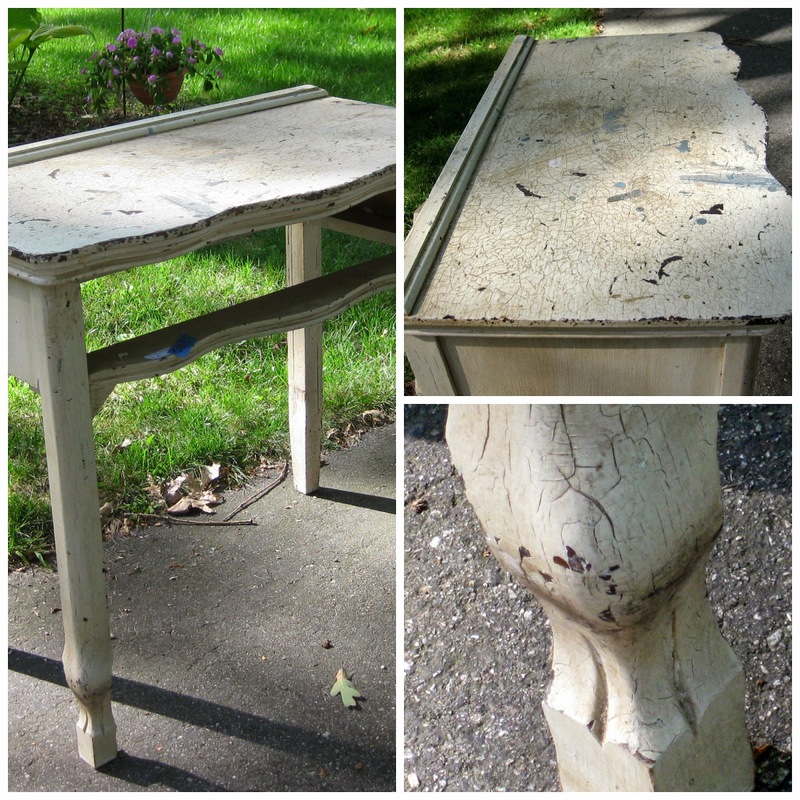 Both the table/vanity and the mirror were found at estate sales. When I purchased the mirror, I had no intention of keeping it but when I tried the other mirrors I had hanging around, I wasn't happy with any of them. Fortunately I hadn't done anything with this one yet - it was already the perfect color gray with some aging and chippiness. The only thing I added was some graphite-tinted wax to bring out the detail on the top. Now, back to rehabbing furniture! Before photos of this quarter sawn oak lamp table should have been a video so that you could see that it was so wobbly it could barely stand up! Other than that small detail, in pretty good shape. Every joint had to be re-glued but now it's sturdy and sporting a more current look. I often make my own chalk paint to have access to a wider variety of colors. The body of this table was painted with a Behr Oops sample from HD so I don't have the name. It's not as white as it appears in the photo - more of a beige with some gray in it. I usually use unsanded grout to make my chalk paint and have good results but this time I tried a new product - Chalk Paint Dust by My Savvy Sister. I liked it and have enough to do a couple more projects. The only downside is that it I have to order it online. The base was lightly distressed and then sealed with APC's dark wax to bring out the detail on those curves. Top was lightly sanded and restained with Minwax Espresso, then sealed with Wipe On Poly. This beauty was sitting in the cellar at an estate sale, just waiting for me! It's been very patient, waiting for me to get around to rehabbing it and then waiting for the other projects in that half bath (painting, new floor, etc.) to be finished so that it could take center stage. Almost done - I'll post photos soon.